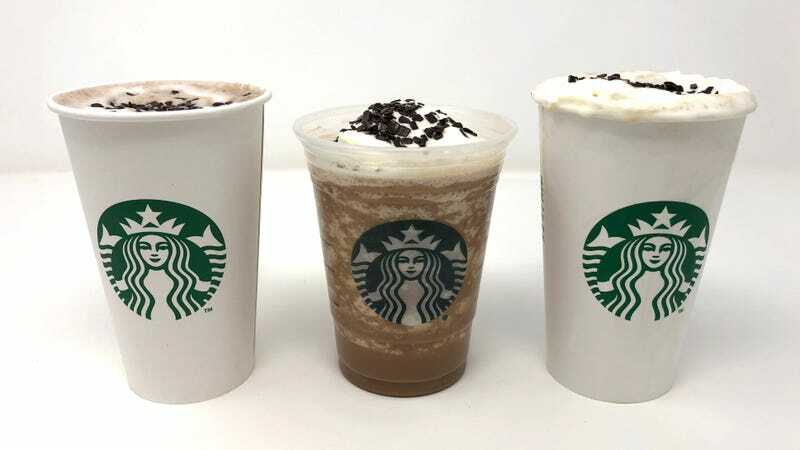 The trio of beverages features Starbucks espresso and a silky swirl of white and dark chocolate topped with whipped cream and a stripe of chocolate sequins. Can’t believe I’m saying this, but the Black And White Collection could use a bit more unicorn flash, a little less subtlety. The white and dark chocolate weirdly succeed in cancelling each other out, so the overall effect is pretty bland. It’s like that Peanuts cartoon where Linus makes Lucy some hot chocolate. Lucy says, “It’s terrible! It’s too weak! It tastes like some warm water that has had a brown crayon dipped in it!” Linus tastes it and says, “You’re right. I’ll go put in another crayon.” Starbucks, you need another crayon. 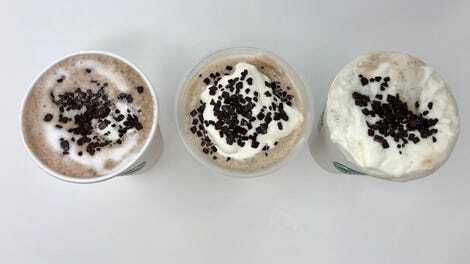 Of the three items—Black And White Mocha, Black And White Hot Cocoa, or Black And White Frappuccino—one is a clear winner merely because it’s not trying to work its way out of Flavorlesstown merely by tasting like an abundance of sugar. All of these have a considerable amount of the sweet stuff, from the mocha’s and hot cocoa’s 50ish grams to the frappuccino’s 60ish, and all hover around the 430-calorie mark. But at least the mocha didn’t taste super-sweet, thanks to the coffee, and because a lot of the heavier dark chocolate floated to the bottom and had to be stirred up again. The frozen frappuccino blessedly got a little less sweet as some of its iciness melted. That hot cocoa, though: It was the only one of the drinks with any left over after our staffers got through with it, and by that I mean there was about 7/8ths of it left. Buddy The Elf doesn’t even have that much of a sweet tooth. You can kind of taste an appealing hint of the white chocolate, but the sugar completely overpowers it. This special lineup will be at your local Starbucks until the end of this week, reportedly, if you want to check them out. Or, you could order Starbucks drinks that actually taste like things. Your call. Happy new year!